Dearest Blog: yesterday it was off to Marquee Cinemas to see--you guessed it!--Star Wars: The Force Awakens. Spoiler level here will be mild, nothing you wouldn't know from the trailers. In a post-Empire galaxy far, far away, the resistance fights the tyrannical rule of the First Order. Dear Reader(s): Is there anything quite so magical as being in a dark theatre when that crawl starts and the iconic Star Wars theme kicks on? I think not. Fortunately, Star Wars: The Force Awakens is extraordinary from the theme's opening note to the end credits' final line. The Force Awakens is littered with enough nostalgia to keep the die-hards happy, but it's far from just a stroll down memory lane. The new story and new characters fit the universe with nary a hiccup, well crafted enough to stand on their own without upsetting the whole galactic applecart. New leads Daisy Ridley and John Boyega (Attack the Block...YEAH!) are so terrific the naysayers will be forced to come 'round, if they haven't already, and I'd be lying if I said I didn't get a little teary through the biggest smiles ever when my old favorites appeared. The Force Awakens has terrific effects that seem to come right off the screen, even in 2D, and it goes without saying the score is majestic. The movie's a hair on the long side, but that's a minor quibble with a picture that manages to please old and new fans alike, garner nearly universal support for a very polarizing director, and effectively redefine Hollywood's definition of "blockbuster." 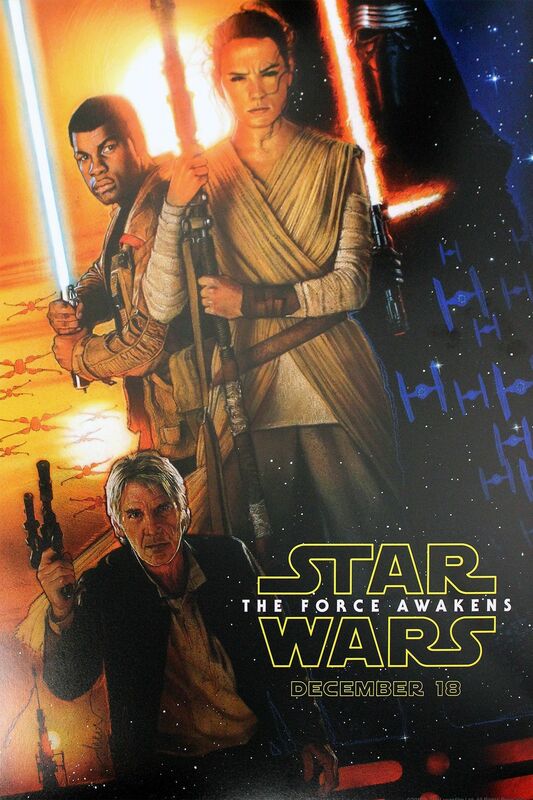 Star Wars: The Force Awakens runs 135 minutes and is rated PG13 for "sci-fi action violence." That rare item that lives up to the hype, of a possible nine Weasleys, Star Wars: The Force Awakens gets eight and a half. (Small bonus for having an actual Weasley in the cast!) Also, I want a BB-8! !